I noticed in a recent newspaper an account of your return to New York. So I am writing you direct about the shipment of six pieces of potteries, sent from Paris and referred t oin your letter of October 10th. The shipment arrived in good order and I examined the lot yesterday. I have determined to keep the Bowl, your No. 2, and the Bottle, your No. 3. Your list gives the prices for the Bowl and Bottle, but it does not mention the price of your No. 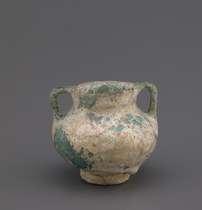 6—a small two handled cup in turquoise glaze. I would like to purchase the cup if the price is not too high. Will you kindly let me know how much it will be. After which I will remit for all three pieces. The other three pieces will be packed and sent by express to your New York address promptly. "Charles Lang Freer to Dikran G. Kelekian, April 7, 1905," in The Peacock Room, Freer Gallery of Art, Smithsonian Institution, Item #3576, http://peacockroom.wayne.edu/items/show/3576 (accessed April 22, 2019).